← What’s Up with the Pink Candle? 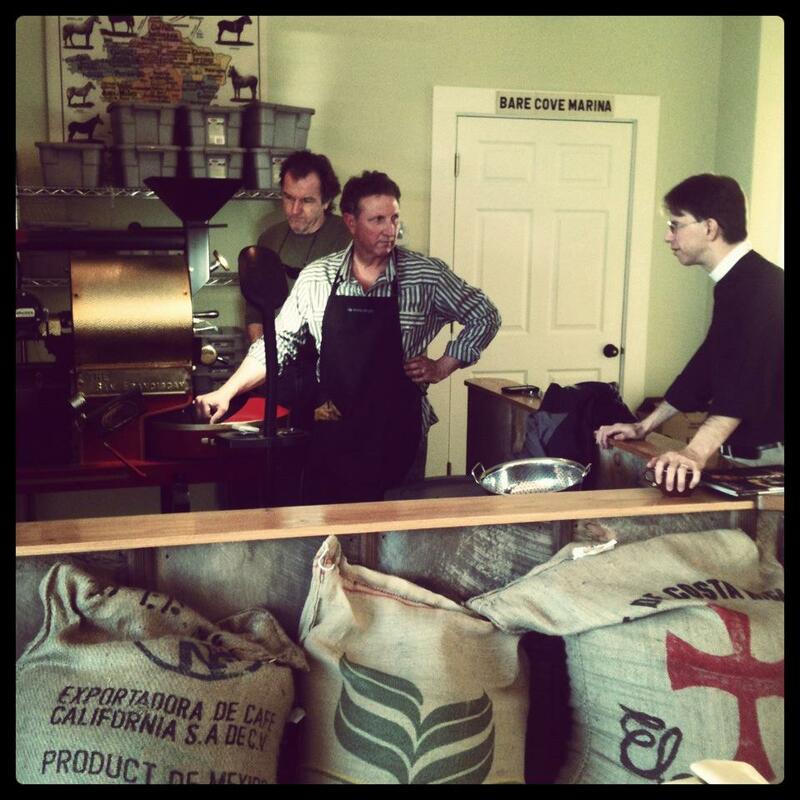 Father Tim Schenck looks on as Redeye Roasters owner Bob Weeks roasts a batch of Brazilian coffee. To celebrate the opening of Redeye Roasters, I couldn’t help myself from writing an article that appears in the current edition of the Hingham Journal. Naturally, I wrote it while sipping coffee in the new shop. Mecca has arrived in Hingham – at least for coffee aficionados. With the opening of Redeye Roasters Coffee & Espresso Lounge, coffee drinkers throughout the South Shore finally have a destination artisanal coffee shop to call their own. Ever since moving to Hingham 2½ years ago, one of my great frustrations has been the lack of a decent coffee shop in these parts. Believe me, I’ve looked everywhere and sipped a lot of coffee. When your sermon-writing ritual depends on sitting in a coffee shop with a laptop, not being able to get a superior cup of java takes on cosmic proportions. Well, perhaps not cosmic, but I certainly wouldn’t want to subject my parishioners to un-caffeinated preaching preparation. While America, and much of Massachusetts, might “run on Dunkin,” those of us who are self-pronounced “coffee snobs” do not. Two words come to mind when easing into the drive-through at Dunkin’ Donuts: brown water. Nor does Starbucks hold a candle to any independent coffee roaster. Their burned dark roasts kill off the nuanced flavor of coffee while their corporate atmosphere kills off any ambiance. Yes, I recognize that I’ve likely offended a lot of people with that last paragraph. But once you make the switch to specialty coffee, you just can’t go back. I was “converted” at a wonderful coffee shop in Tarrytown, New York, that roasted all of their beans on-site. Coffee Labs Roasters remains one of my favorite places in the world and I drank enough coffee while on sabbatical in 2008 to finish writing a book there. I also love Bob’s story. After being laid off as the art director at a Boston marketing firm in 2006, he started roasting coffee out of his home. He has been a fixture at the Hingham Farmers Market selling pour-over coffee, espresso, cappuccino, and lattes out of his custom-designed coffee truck and his blends have been available by the pound at gourmet grocery stores like the Fruit Center and Whole Foods. Along with a growing number of people, I’ve been nagging Bob to open a coffee shop since I moved to Hingham and started stalking him. He’s been graciously donating freshly roasted beans to St. John’s for the past two years in support of my strong belief that churches need not be havens for bad coffee in Styrofoam cups. As I like to say, the church is God’s House not Maxwell’s House. Sure, we had to invest in an industrial-sized grinder but nothing beats walking into church on a Sunday morning to the aroma of freshly ground coffee. Bob is still roasting coffee but the roaster has moved to the new shop where customers can observe the process and ask questions. Located off of 3A across from Stars on Hingham Harbor in the Bare Cove Marina building, the café offers panoramic water views. Between the view, the smell of freshly roasted coffee, and the delicious, hand-crafted drinks, Redeye Roasters is a sensory experience in every way. At its best, a coffee shop builds community. People gather to chat and plan and sip their favorite beverage and disagree and support one another and meet new people. Something magical happens that transcends our connections through social media and e-mail and texting. There’s just something about coffee that brings people together. I hope you’ll stop by and support Bob in this endeavor. The coffee is superb, the staff is friendly and knowledgeable, and Redeye Roasters is yet another reason to love Hingham. The Rev. Tim Schenck, Rector of St. John’s Episcopal Church, writes the monthly “In Good Faith” column for the Hingham Journal. I can almost smell it, and rejoice for you. A coffee shop isn’t the only way to get community, though; I’m off to my LYS (local yarn shop) for a knit night with friends. We can teach you to knit; you can drink coffee (or other beverages) while you do it. Thank you for your blog; I’ve been enjoying it. Thanks, Judith. No knitting for this coffee drinker. I’m afraid I’d spill the coffee all over the yarn!